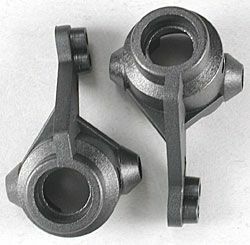 This is a pair of the Steering Blocks for the Traxxas Nitro and Electric Powered 4-Tec Touring Cars. These Blocks support the Wheel Hubs and connect to the Front Suspension Arms and Steering Tie Rods. REQUIRES: Inserting two 5mm x 10mm ball bearings, fastening to Front Suspension Arms, and Tie Rods.